We come now to the pinnacle point of Kansas, Mt. Sunflower (elev. 4,039 feet). Mt. Sunflower is similar to Panorama Point in Nebraska in that it is not a distinct feature of the landscape, but more of a gentle rising wave in a landscape of similar swells. Mt. Sunflower is also on private land, but the summit area is more decorated than Panorama Point, and includes a few whimsical touches which are enjoyable. I visited there in 2010, but failed to commemorate the occasion with a photo (oops), so I don’t have an arm length “selfie” to inflict you with this time. 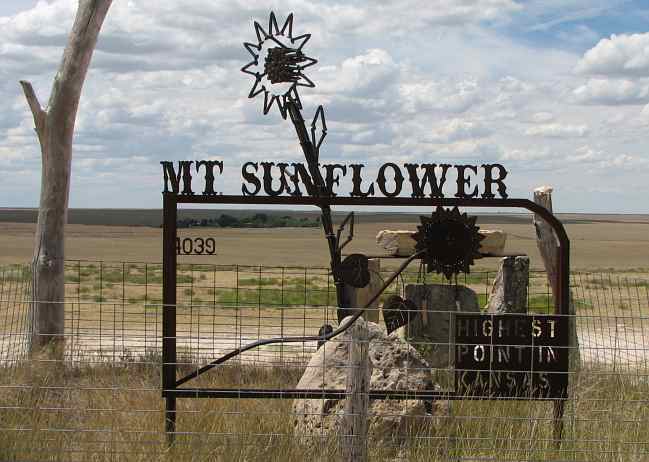 Mt Sunflower is on the far western edge of Kansas, just a stone’s throw (not quite literally – it’s about a 1/2 mile) from Colorado, and only about 25 miles south of I-70 in Wallace County. The routing for the Great Plains Trail is still underway, and there is a possibility that the GPT will include the Kansas high point, but it is more likely that it will stay in Colorado and pass to the west a considerable distance. Once again – Happy Highpointing! This entry was posted in Uncategorized and tagged high point kansas, mt sunflower, wallace county. Bookmark the permalink.